Second Chance Rescue (SCR), in Bunnell, Florida, is taking part in a Facebook challenge that ends on May 31, and would love for you to help them win. They save lots of animals from local kill shelters, including Orange County Animal Services, in Orlando, Florida. The competition is a simple one - you just have to click on a link by May 31! Hayley Kazee, their youngest volunteer, is still in high school. She's been with the rescue for years, spends every day caring for the animals, walking them, cleaning their runs. She's reaching out for your vote to help her help SCR. She says, "SCR is currently in a competition to win $1,000 for the rescue! All you have to do is LIKE a picture on Facebook and SHARE it with your friends! You can share this so many different ways! You can share it on Facebook, share it through email, texting, Twitter, Instagram, etc. If you just copy & paste this, it is very simple to share! To LIKE our picture, please click on this link." Then find the photo Haley created as their entry, the picture of Eleos. Then if you click and LIKE her photo, she gets your vote! If SCR gets the most likes, they can win $1000 for the rescue. This is simple, easy, only takes about 5 seconds and could help the rescue so much! Eleos was rescued from OCAS and was in terrible condition. She had been caught on fire, and is recuperating under the care of SCR. If they win the $1,000, it would go a long way towards helping them finance a new transport van for transporting their dogs to and from adoption events and fundraising events. They will also use this vehicle for appointments with veterinarians, groomers, home visits, pick ups, etc. They also run a transport for low cost spay neuter and will be going to Jacksonville and back four times each week. They average about 150 thousand miles a year on this vehicle. Ideally, they are looking for a cargo van or shuttle vehicle where they can safely transport 10+ dogs at one time. If they can find a generous company that would donate the money to purchase a vehicle they would generously provide advertising for the life of the vehicle. They would put the corporate logo on the vehicle in large font along with a saying such as "This Transport Generously Donated By......" or whatever would work for the company and SCR. They'd also put your logo on their web site and in their newsletter and hand out any literature the donor might have with each adoption. They have a "bag" that goes with each animal adopted at their events. If you have a van that might work, and you'd like to donate it to them, that would be great as well. Debi, from SCR, writes, We had a Chevy 1500 Econoline Van for three years that has recently "died" with 462,000 miles on it! We now have a small Ford Windstar that has LOTS of work needing done and it only holds four dogs or so at once. We have to jump the battery each time we hope to use it and that doesn't always work. 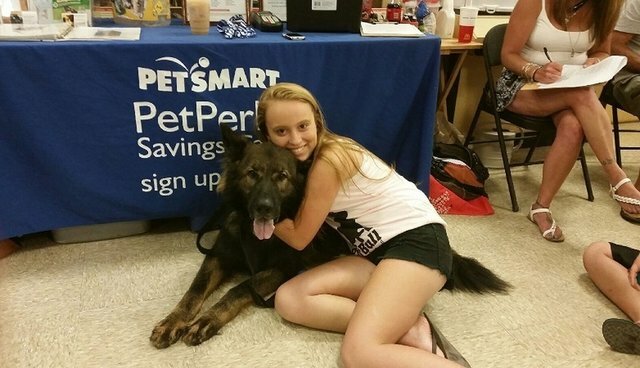 We try our best to have Adoption Day every Saturday at Petsmart in Palm Coast and at Petsmart in Daytona Beach. We hope to soon hold events at Petsmart in St Augustine twice a month and at Petco in Ormond (as soon as they open) every Saturday too! We also have events at least 4 times monthly. Without a reliable vehicle with cool air for the dogs, we are unable to make it to these events to show our dogs, so they can't find their forever homes. Unfortunately, we don't have a public facility and these events are they only way for our wonderful dogs to meet potential new families. SCR has so many beautiful, sweet and loving dogs looking for their forever homes! All dogs are fixed, up to date on vaccines and microchipped prior to adoption and the adoption donation is $150 for everyone. Second Chance Rescue also does adoptions every Saturday at Petsmart in Palm Coast from 11-4 and you can meet some of the available dogs there. Here's their Facebook link and some information on just a few of them! Shyla is a two-year-old Pit Bull/Shar Pei/Boxer mix. She was rescued after being left for dead on the side of a country road; emaciated, malnourished and covered in mange. Because of her past, she is fearful when meeting new people but when given some time to adjust, she is the best girl! Once she knows you, she will role over for belly rubs. She knows sit, paw, and lay down. She is spayed, up to date on vaccines and microchipped. You can read more about her on her Petfinder Profile. Rango is a one-year-old Lab/Pointer mix. He is very sweet, outgoing and smart! He is good with other dogs and kids. He needs a forever family to show him some manners and teach him. He's very smart and will catch on quickly, just needs someone to spend time with him and in no time will be a wonderful addition to any family! He is neutered, up to date on vaccines and microchipped. You can read more about him on his Petfinder Profile. Domino is a 10 month old Boxer/American Bulldog mix. Domino is a very fun boy that rescued from a local shelter just minutes before he was scheduled to be put to sleep. This sweet boy is just so happy to be safe and would love to find his forever family! He's playful, friendly and very loving. He's good with other dogs, cats and kids. He's housebroken and just loves to curl up next to you on the couch and watch some television! He's all around a great dog! He is neutered, up to date on vaccines and microchipped. You can read more about him on his Petfinder Profile. One of their special dogs is Koa! This German Shepherd mix boy is gorgeous! He's about 100 lbs., five yrs old and sweet as can be! He's vaccinated, heartworm negative, on preventative, neutered and microchipped. He's housebroken and very well mannered. He is good with dogs, but not cats. He loves people. He loves to fetch tennis balls and just likes to please his owners. He is all around an an excellent dog! He was rescued after his elderly owner passed away and none of the family wanted him. He is a very quick learner and will make a wonderful pet! He does have the possibility of hip dysplasia in the future due to his breed and stature and may require medication as he ages. He needs to find a loving and forever home that understands his breed. To read more about Koa, please visit his Petfinder Profile. In the slideshow provided with this story, you'll also find photos of Cisco, a five-year-old JRT/Dachshund mix who is a little fearful at first. And also Bolt, a 7-year-old black Lab mix, who is very bonded with Tiko, a seven-year-old Min Pin mix who is very sweet and loves to play! SCR adopts out approximately 700 animals annually and helps Spay/Neuter over 2000 of our community's pets each year. They are a 501(c)3 which makes your donation 100% tax deductible and they have been saving lives over 30 years. If you are interested in adopting any of these great animals, please email Haley at Haley0076@gmail.com or Debi at Bpdebig@aol.com. You can visit their website here! If you'd like to help out with a donation, they have a GoFundMe here!